Romantic hotels to celebrate Valentine's Day. Business trips to South By Southwest (SXSW). Reservations.com offers a variety of choices, from the most popular hotel, to the least expensive. The site even allows ads to run on its site that enable travelers to compare prices on Tripadvisor, Hotels.com and Kayak. 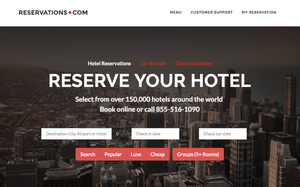 With a love for risk, Yatin Patel and Mahesh Chaddah co-founded Reservations.com in 2014 and set out to turn the travel site into one of the top online hotel booking Web sites using Bing Ads. While the two are passionate for creating something from nothing, Patel is a veteran of the travel industry and was one of the first to start a hotel booking engine in 1997. An interesting idea, but the site was a bit ahead of its time. To foster growth for Reservations.com, the two began using Bing Ads between two and three years ago to reach the now more than 1.5 million travelers who have used the site -- up tenfold year-over-year since its inception in 2014. More than 2 million rooms have been booked for overnight stays at the more than 150,000 hotels the company offers worldwide. Reservations.com runs between 50,000 and 70,000 campaigns monthly, targeting a variety of demographics in various locations. These campaign can change biweekly. The company spends millions of dollars monthly to support the paid-search campaigns. The site sees about 100,000 unique visitors daily by focusing on paid search to drive visits. Chaddah says the site has invested heavily in phone-based concierge services, which seems to attract a higher number of searchers on Bing versus other engines. Call extensions provide customers with a convenient way to book directly from search results, while device targeting has enabled the company to target smartphones over tablets for a smarter spend. Overall, the results are a 20% decline in the cost per click compared with other ad platforms, 18% higher return on investment, and 172% year-over-year increase in traffic using Bing Ads. In all fairness, Reservations.com also uses Google AdWords and Yahoo Gemini, along with social targeted ads in Facebook, but finds that the Bing Ads campaigns hit certain targeted audiences that the company cannot reach in other platforms. "The Bing audience is a bit more affluent, educated and a little bit older," he said. "The audience also is more likely to have stayed in a hotel."